*Buongiorno! That is how the two art classes were greeted today as I shared photographs with them from my time in Italy, and hopefully some of my sharing inspired them with ideas for their final Advanced Art project. *A new fun gadget arrived in the mail today. I ordered an Amazon Firestick to stream television show, movies and music. I wanted to take our Wii, which now streams shows on our television, and hook it up to the television in the basement so I can use the Wii in that space. I looked online, and the Firestick was only $30.00, so I thought I would purchase one. So I spent some time downloading apps that give me different options of watching things on television. *Christy came over to visit, and brought some vegetable seed to share with me to plant in my garden. I got two kinds of cucumbers, Swiss Chard, cabbage, peas, green beans and summer squash. 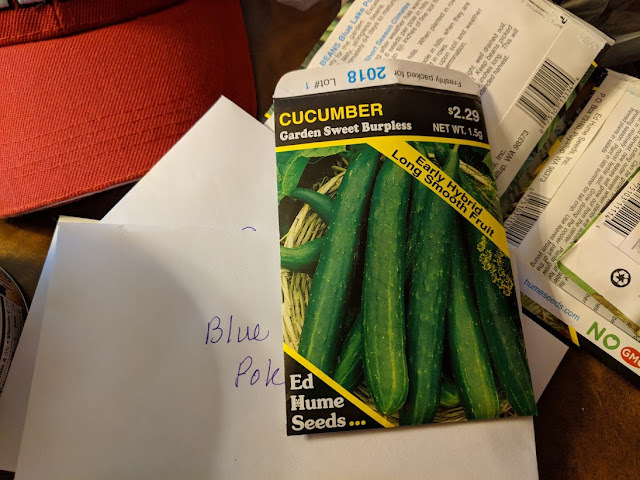 This will help me to organize my vegetable garden beds, and decide what else I will be planting. *After Paul arrived home after Parent/Teacher Conferences, we made a joint effort of preparing dinner. He fried up some steak and mushrooms, and I sauteed some shrimp and some zucchini. It was very delicious! As we were fixing dinner, we had the current day’s PBS News Hour streaming, one of the perks of having the Amazon Firestick. *After dinner I watched another episode of The Midsomer Murders, continued working on my knitting project, and then headed to bed.